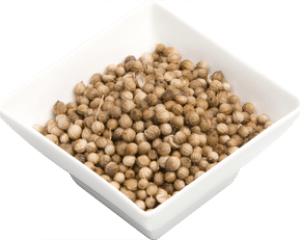 Coriander seeds are obtained from the coriander (or cilantro) plant that belongs to the carrot and parsley family. They have a yellowish brown colour and a spicy lemon flavour. The whole seeds are more often used in savoury dishes and are particularly good in dukkah and panch poran. They add a rich roasted flavour and are an essential curry spice in India and Middle Eastern cuisine as well as being used widely in Northen European cuisine. 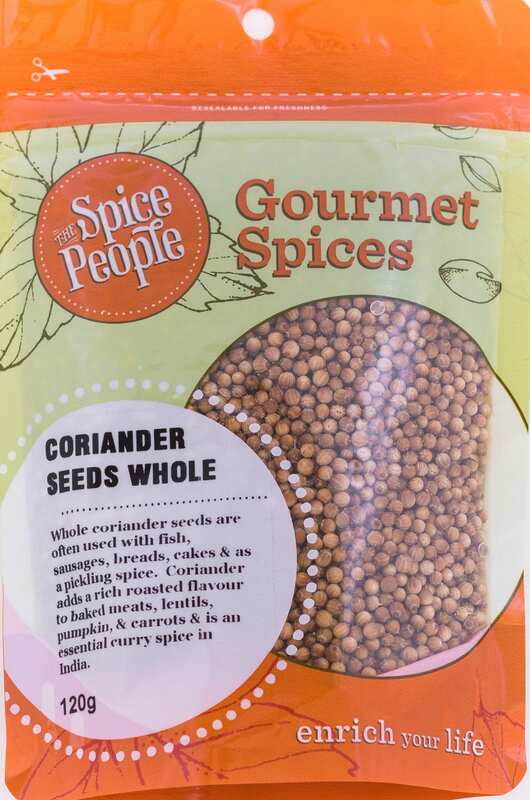 Coriander seeds, from the coriander plant, can be ready for harvest when the plant turns brown in colour and dry in texture. If harvested too soon, immature light green seeds can have a bitter flavour. To harvest, the crop is cut, tied in small bundles, and sun-dried for several days. Traditionally, to separate the seeds, either the sheaves are beaten with stick or a lightweight roller is used to wear off the pods. They have a yellowish brown colour and a a delicious flavour reminiscent of orange peel and sage. It is a versatile spice that works in both savoury and sweet dishes. It is an essential spice in Indian and Middle Eastern cuisine. Coriander seeds possess many plant-derived chemical compounds that known to have been anti-oxidant, disease preventing, and health promoting properties. Use whole seeds with fish, German sausages (Thuringers), soups, breads and cakes and as a pickling spice.